The combination of EPIMMUN™ epidermal immunization via lasermicroporation with a skin-resident DC targeting vaccine formulation shapes and potentiates immune responses. The delivery of immunogens to relevant cells in targeted skin layers induces a strong immune response. A study with the objective of targeting dermal cross presenting CD8a type DCs for delivering antigen as immunotherapy treatment against melanoma in mice5 showed that Xcl1 specific fusion proteins bound specifically to the dermal cross presenting DCs after the process of laser microporation. 5, Graphic left: Terhorst et al. Laser-assisted intradermal delivery of Xcl1-specific fusion vaccines induces potent anti-tumor response. 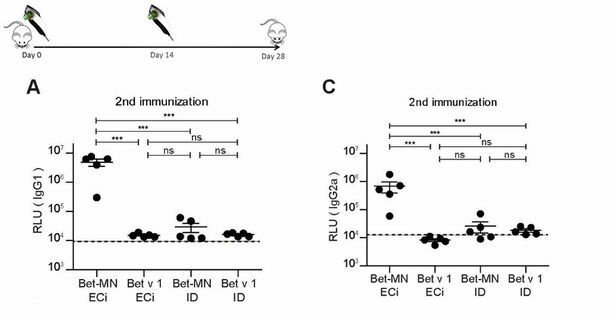 Results of skin vaccination using targeted Bet mannan nanoparticles in a mouse model showed that coupling of Bet v1 to mannan boosts its immunogenicity more when delivered epicutaneously than intradermally7 (see data on the right). 7Machado et al. Synergistic effects of dendritic cell targeting and laser-microporation on enhancing epicutaneous skin vaccination efficacy.